From the whole team thank you, this will allow to help more incredible people just like Jen.?? 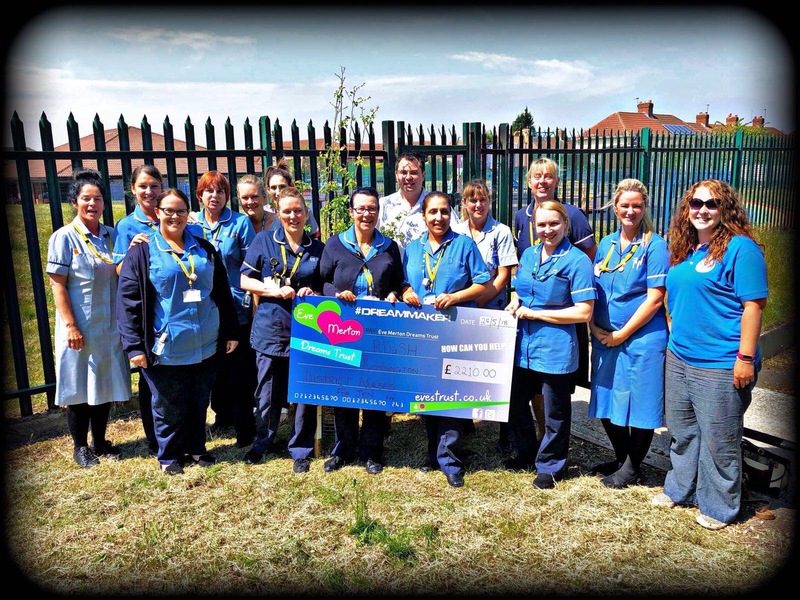 The Rossington district nurse team in January 2018 pledged to raise £1,000 for the Eve Merton trust after 1 of their team ‘Jen’ was granted at dream after being diagnosed with a terminal illness in Nov 2017. Sadly Jen left us on 10/May/2018. And we are still going to carry on supporting the dreams trust and fundraise in Jens memory. The team started by drawing up a list of ideas to raise money and started by collecting 5p’s in a jar then asked our colleagues from other district nurse teams to join in. As some of the teams have worked with or known our team member they were enthusiastic to help. The other district nurse teams have helped by doing bake sales, raffles, name the bear, donations and tombola’s. The Rossington team had a car boot, easter raffle, knitted Easter chicks, sweepstakes, sold bags fo sweets and are still thinking of other fundraising ideas. We were given a very generous donation from Mr Donnolly, who collects money In a large bottle over the year and donates to a local charity and this year he chose to support our fundraising efforts. We have now raised £2,210.00 and are ecstatic to have smashed our target to support this fantastic charity. Jade Baines, Julie Boyles, Laura Bennell, Stephanie Langstaff, Julie Mallinson, Louise Hill, Deborah Young, Julie Wright, Anna Wilkinson, Julie Tamasi, Nicola Wren, Belinda Swift, Sarah Robinson, Tracy Greenwood, Denise Looker, James Ford, Michelle King, Rebecca Hayes, Sarah Matthews, Shelli Ashton, B Walls, Mr Peter Donnolly and all the district nurse teams in doncaster. Car boot at Keepmoat stadium.